Today is Tuesday. Yes, yes it is. But it feels like a Monday. Why? Because the Mister has been sick as a dog, which means all the things I usually "do all by myself" I am actually doing all by myself. No silent partner in my grand design schemes. Nobody rolling the cakepops in the background like I'm living in a cooking show where everything's pre-made. I'm on my own... and one day, when he is less sick and whiny about it, I will start a conversation with "Hey, remember that one time when you were really sick, and I had a whole party to throw together in a week, and you couldn't help me, and suddenly I realized you're really nice to have around, because otherwise my life would be really really hectic, all the time...?" Without wanting to risk tripping over my words, I got to thinking of nice gestures to let my Mister know I appreciate him. Which got me thinking that there are a few other people for whom I should make similarly nice gestures. Which started making me think too much, which led to a momentary lapse of judgment where I thought to hell with it, and I should just send everyone flowers. Which I quickly rethought, because flowers are so iffy and short-term and so easy to send.... better than nothing, oh yes, but so easy. And not in a way that settles easily with me. Desserts, however, settle very well with me. Especially cute desserts. I've said it before, and I'll say it again. Love, love LOVE this. Who wouldn't love to receive these beauties in lieu of the standard bouquet? The part I love the most is the fact that the creator, SweetSugarBelle, threw these together as an extra-special way of sending flowers to a friend in need of a pick me up. Check out the original post to readup on the full story (and for the DIY tutorial). This has definitely made it onto my list of things to try (or request) asap! I recently stumbled upon PopCultureCakePops on Etsy. The cakepops from this shop look just as good as their hilarious descriptions. "Because you can't take yourself seriously while you're eating something on a stick." So so true. 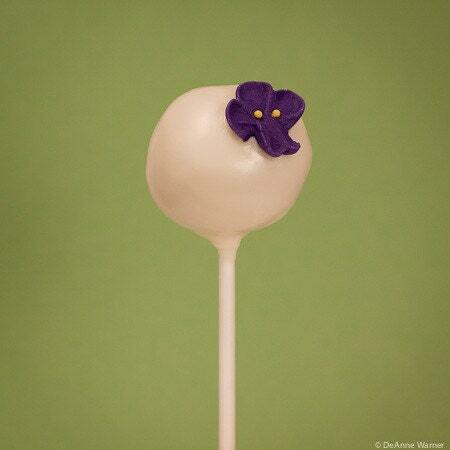 Our simple flower pop, made with yellow cake, white chocolate coating, and a single flower. Perfect for mom, bridal showers, or just because. Hostess with the Mostess featured a tutorial a few years ago showcasing delicious, adorable, and fairly basic cookie pops c/o The Decorated Cookie. 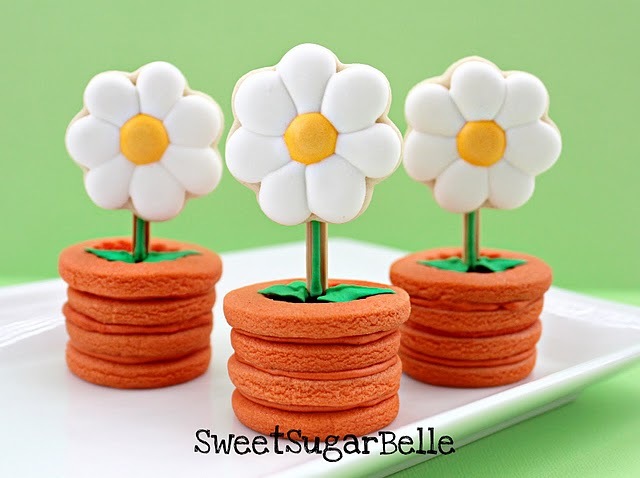 Imagine this delicious and adorable cookie arranged in a bouquet! It wouldn't last much longer than a bouquet of flowers on a hot window sill, let me tell you. Make sure to check out the tutorial. Why not surprise someone special with a cute vase or mug filled with these sweet little things? Once in awhile, adorable things pop up in unexpected places. 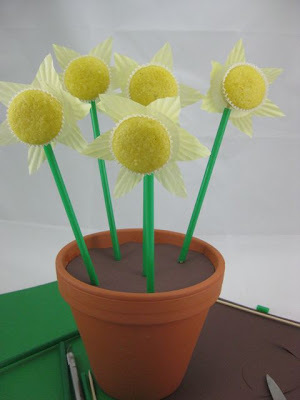 This Flower Pot Pudding Kit from Perpetual Kid is one of those unexpectedly adorable things. Imagine this as a just-because gift, before or after it's put together. Everyone loves pudding, and this is definitely a fun way to give someone flowers. Feeling like a kid again is just an added bonus. This tutorial from Instructables shows you how to use mini marshmallows to make beautiful flower cupcakes. If you take a read through, it's actually really easy! But, like all good things, it doesn't look it. These are gorgeous! And I love marshmallows. Your quest: read the instructable, then gift this to someone special. NOW. And by someone special, I mean me. I absolutely love simple, crafty DIY projects like this one from MegaCrafty. Using basic baking supplies, a flower pot, and some ingenuity, you can have yourself a bouquet of beautiful spring daffodils! I love how something so simple has such a big awesome-factor. 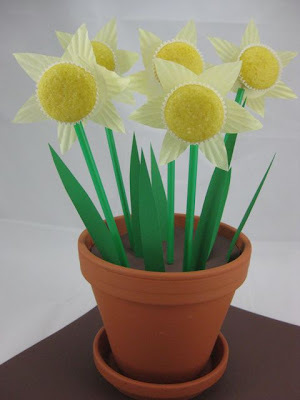 Daffodils may be more of a spring thing, but tell me you wouldn't love to get a pot of these on your desk or counter from someone who wanted to let you know you rule. ...Okay. Now tell me with a straight face. Have any favourite spins on sending flowers? I'd love to hear them!